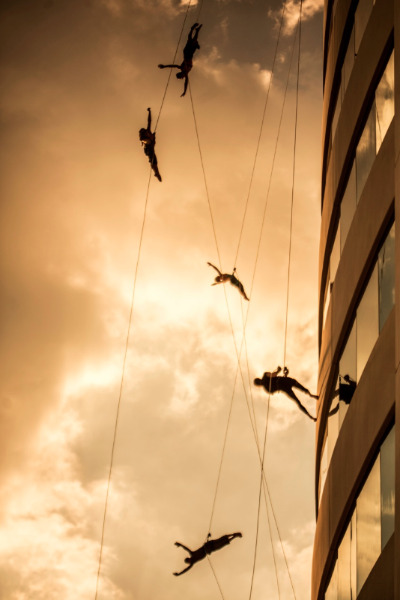 2013 has been an incredible year for BANDALOOP, and we want to extend our warmest thanks for your support! Together we successfully produced HARBORING, our finest indoor work to date, and in no small way because of crowd sourced funding. We brought our shows to new audiences on a North American tour, and we received exciting coverage in the media, including on CBS This Morning. Imagine what we can accomplish with your help in 2014! Your support will make possible another year of unforgettable shows, creating lasting memories and inspiring audiences worldwide with free, public art. Stay tuned as we prepare to take our audiences by storm with tours across the Americas, back to Europe, and beyond Asia. We will also be mantling a re-mount of “Crossing”, BANDALOOP's seminal mountain work for film, and a new large-scale urban work called “Forgotten Walls”. And of course, there will be new opportunities for you to learn BANDALOOPING in workshops specializing in off the ground craftled by our dancers. Please help us make our pioneering vertical dance accessible to audiences of all ages all over the world by DONATING ONLINE TODAY! Gifts of every size are enormously helpful and 100% tax deductible. Your generosity and ongoing support means so much to us and inspires us to continue sharing our vision of perspective-bending dance. Let's explore new heights together in 2014! 3 MORE LOCATIONS IN 2013 - JOIN US! 10 day run of show at the Venetian Campanile Tower!